If you are like us, you are constantly on the hunt for widgets to fill up all that real estate on your Android tablet. The newest batch comes from cloud.tv, and my-my do they look impressive. There is a set of 13 widgets, including 3 over-sized “tablet only” widgets which look great. The appearance of each widget can be customized in a variety of ways ranging from the clock’s skin, to whether or not you want system toggles or weather displayed. Definitely a good buy for the limited time only price of $0.99. 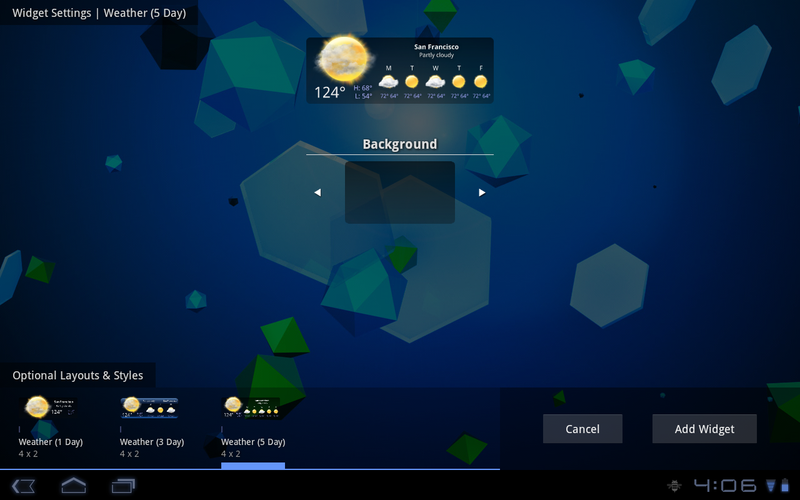 Anyone know of some other awesome Honeycomb widgets we are missing?